Manager Garry Haylock brought in two new faces for this Boxing Day game against Maidenhead, Omari Coleman from Fisher Athletic and Calum Botham whom he has loaned from Wycombe. 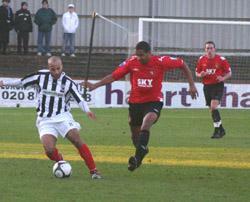 The visiting Magpies also had a familiar face making his debut for them in the shape of former Hayes & Yeading skipper Nevin Saroya. The first half on this cold and blustery afternoon at Church Road was far from an exciting spectacle, in fact but for the final four minutes of the half nobody would have been blamed for not bothering with the second. The first noteworthy (half) chance of the first half saw the Magpies Dale Binns chip the ball to the far post where Ashley Smith headed wide without troubling Aaron Howe. Believe it or not the next chance came as late as the 41st minute, Ram Marwa played the ball left to Botham who beat Bobby Behzadi into the Maidenhead area but his angled shot hit the side netting without troubling Shane Gore. As stoppage time arrived, Danny Allen-Page played the ball to Coleman inside the area, his lay off found Josh Scott but he screwed his shot wide of the target. Stoppage time saw two more good chances for Hayes & Yeading. 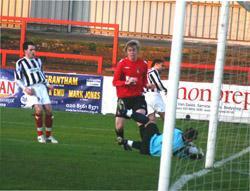 James Mulley attacked the Magpies area from the right before touching the ball off to Scott, his swerving drive was blocked out for a corner by Gore's trailing leg. Coleman then also went close when he met an Allen-Page centre but his header was just too high. Garry Haylock seemed to have given his side a reminder of the task at hand during the break as we came out much more focused on attack in the second half. Just two minutes had been played when a Tom Cadmore free-kick was pumped into the box from halfway, Coleman flicked on to Mulley but his close range header was grabbed on the line by Gore. Minutes later Cadmore again started the move from halfway when he sprayed a superb cross field ball to Mulley on the right, the wide man cut inside and beat two defenders before firing a left footed shot wide of the target. Coleman should have marked his debut with a goal on 55 minutes, Steven Gregory and Mulley combined before finding Allen-Page, the full-backs centre found Coleman unmarked but his powerful header cleared Gore's crossbar by inches. Less than 60 seconds later it was Cadmore finding Mulley again, this time his low whipped cross just evaded the sliding Marwa and Scott. Midway through the half the visitors finally gave cause for concern as Behzadi weaved his way into the area before firing wide of the target. Minutes later Howe produced the save of the game, from his own teammate. Cadmore's clearance was charged down and the ball fell to Richard Pacquette 20 yards out, just as he was about to pull the trigger he was tackled by Botham but the ball span in the air and was heading for the United goal but for Howe's full stretch tip over. 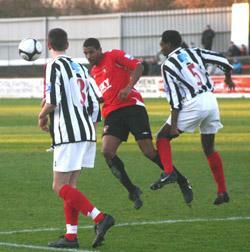 Far from panicking after this close shave, just 5 minutes later Hayes & Yeading were two goals to the good. An Allen-Page clearance saw Scott outpace Saroya before overrunning the ball, Gore dived on it but let it go from his grasp and Scott kept his composure to fire past the defensive cover on the line. 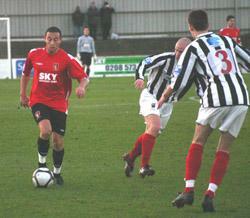 Just two minutes later it was a first United goal for left-back Gary MacDonald who rose highest to plant a perfect header into the corner of Gore's net. Three minutes from time United could have grabbed a third when a long Howe wind assisted punt was weakly headed towards Gore, Scott got to the ball first but the keeper did well to block away his attempted lob. 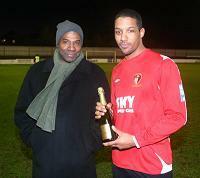 Sponsors United Man of the Match: Josh Scott.